A BUDGET is a plan for keeping track of income and spending over a period of time. Household budgets help people set short- and long-term goals and avoid financial difficulties, such as too much debt. Budgets can be helpful, but they are not easy to implement. Remember, it takes planning and discipline to make a budget work! Thomas and Carrie budgeted carefully and are ready to go on vacation! 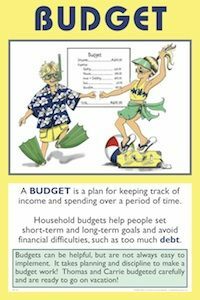 A budget is useful because it helps families control their spending and avoid financial difficulties, especially too much debt. Budgets are usually broken down into fixed and variable expenses. Fixed expenses are those that stay the same each month, such as rent, fixed–rate mortgage expenses, or a car payment. Variable expenses are expected expenses, but they change each month, such as gasoline or food expenses. Students should recognize that variable expenses are more easily changed than fixed expenses. It is also important to understand the critical importance of planned versus unplanned expenses. Planned expenses, which can be fixed or variable, are those that you expect. The biggest “budget busters,” though, are the unexpected expenses, such as car repair, a failed appliance, a leaky roof, or unexpected medical costs. If at all possible, every monthly budget should include putting some money into an “emergency” savings account to use for unplanned expenses. Budgets can be helpful, but they are not easy to implement. Remember, it takes planning and discipline to make a budget work! In small groups, have students write down and discuss examples of fixed versus variable expenses. Do the same for planned and unexpected expenses. Create a bulletin board listing ways that one can reduce spending each month. Examples include going to fewer movies, walking instead of driving, getting rid of premium cable channels, bringing lunch to school or work, cutting soft drink consumption, getting a regular coffee instead of a latte, etc. Activity 1: Students must estimate how much they think it costs to live on their own. (It’s more than they think!) They must also brainstorm ways to cut back their own personal spending.